Let’s start with the facts: there is no end to jihadist barbarism. So far a single order from IS has led to 23 deaths in Tunisia during an assault on the Bardo museum on the outskirts of the capital. 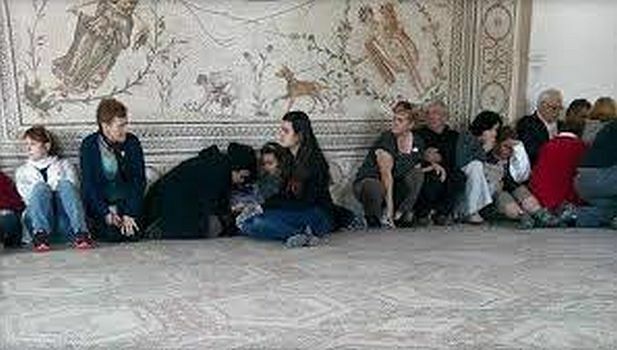 It is the first time since the ‘jasmine revolution’, which overthrew Ben Ali and gave way to the so-called Arab Spring, that such an attack has been made against civilians, foreigners and European tourists. The objective was not so much to attack tourists as tourism, or rather one of the main sources of revenue for the Tunisian economy which is in deep crisis, along with many other southern Mediterranean countries. The attack on visitors from the West has got to create such a climate of terror that the tourist option is cancelled out for the land which historically was one of the first Mediterranean civilisations and home of the legendary Hannibal. The real objective is to weaken the part Islamic, part secular, government of Caid Essebsi which emerged victorious from elections in 2014 and so create the conditions for the expansion of jihadism in the most secular country in North Africa. Those who carried out the attack are well known and have been under the eye of the security services for some time. In recent months the Tunisian army has had its hands on some members of the Okba Ibn Nafaa group, which probably carried out the criminal assault on the Bardo museum and which announced its affiliation to the Islamic State some time ago. The group operates semi-clandestinely and is particularly active in the mountainous area of Kasserine, beyond the foothills of the desert. In February the security forces captured members of another jihadist cell which had killed four National Guard agents in an armed attack on the town of Boulaaba. Amongst those captured from that group the name of Khaled Hamadi Chaieb, more often known as Lokmane Abi Sakher, stands out. One of the most charismatic of the jihadists, he has been in the sights of the anti-terrorist forces for some time. It is equally clear that behind this phenomenon of jihadist religious and political radicalisation lies the economic crisis. The official unemployment rate is 18%, the real figure is well over 20%. Youth unemployment is over 40%. According to World Bank estimates, 50% of young male graduates are unemployed. If we add young women graduates the rate rises to 65%. When put in the context of the lack of any short-term prospect of getting out of the crisis you can understand why the preachers of jihadism, from Saudi Arabia, Qatar and Algeria, have an easy task in indoctrinating many of these young people, into believing in the promise of an alternative to this state of affairs. Its all in the name of Allah, in the name of divine justice, against alien Arab state institutions as well as the corrupt and corrupting Western world. It is this climate, not only in Tunisia, that has brought thousands of young people to join the "phalangists" of the Black Caliph. Three to five thousand young Tunisians have been fascinated by the siren sounds of the "jihadist imperialism" of the Islamic State. The latter arose initially through the funding (as ever) of Saudi Arabia, Qatar and the United States in an anti-Assad move, and then it began to act on its own in an attempt to get a slice of the Middle East’s oil revenues. The same despair that exists in North Africa can also be found in the banlieues of Paris or in the immigrant neighbourhoods of London. Initially they were not badly off, then were frustrated by the brutality of an economic crisis whose devastating consequences have not yet finished. Such consequences fall on workers, the sub-proletariat, and a petty bourgeois becoming proletarian, alike. After experiencing the failure of fake Western democracy as well as the false communism of the USSR, the lack of a future they can believe in pushes thousands of young Arabs into the jihadist fundamentalist networks. But in so doing it contributes to the growing capitalist barbarism of Western imperialism as well as that of the Islamic State, which contains within it all the same capitalist elements of those societies it claims to fight, with a lot of the same elements of economic degeneration and financial parasitism. These elements produce those ferocious attacks against civilians, just as they favour the use of drones and chemical weapons against defenceless people by imperialism's increasingly greedy and murderous "West." The few revolutionary vanguards that still survive within this political scenario have two tasks as a priority. The first is to denounce all imperialist wars. However fought and ideologically justified, they are all part of the same capitalist barbarism. The second is to prepare the subjective conditions of the historic and urgent need for a real alternative. An alternative that will not be based on the same old relations between capital and labour disguised by false religious myths with some obscurantist and national-fascist dressing. At its core is the need to fight capitalism, with its devastating economic crises, its wars of aggression or "defence" for a final break with the economic mechanisms of capital that are the basis of this debacle. It’s an economic and social disaster in which growing impoverishment, unemployment and hyper-exploitation are the common lot for millions of workers. All they get back in return are its wars and the deaths which follow in their train. It does not matter whether it is in Tunis or Cairo, Baghdad or Damascus, if it is under the banner of this or that nationalism, or this and that imperialism. The way to proletarian power is entirely different and comes only through class autonomy. It is an autonomy from all the demands and political premises of the bourgeoisie and demands the overthrow of all capitalist economic categories. It is against those same economic features that the Caliphate is trying to accomplish and strengthen by cynically resorting to the tragic murder of innocent civilians and taking in desperate young people, blinded and ferocious tools of a criminal political design that is still tied to oil revenues, capitalism and its bloody laws.